Dealers are optimistic about the current coin market due to heavy trading in precious metals and rare coins by both collectors and investors. With the metals posting strong gains in the last few days, more activity is expected. Proof Gold Eagles in the original government package are trading at $1,885 per ounce among dealers. The Proof Silver Eagles have been steadily rising, now at $67.50 each. One of the hottest coins on the market is the Silver Dollar. Circulated coins from culls to AU's are brisk sellers for many dealers. Very Good coins are now at $32,125 per bag of one thousand. 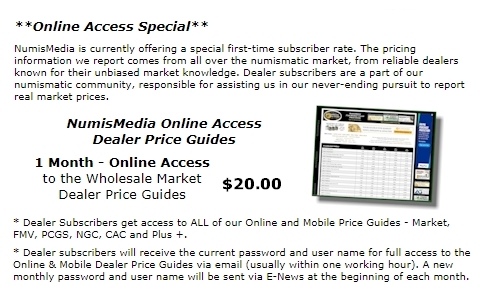 In this week's HD Wholesale Market Dealer Price Guide adjustments appear to be rather sparse. However, this is not a true indication of how active the market is as the year winds down. The market is solid at current levels and accurately graded coins are in demand. Half Dollars through the Dollar series remain hot spots for collectors and, if the coins have the + or CAC designation, even better. Better Date Morgan Dollars are showing signs of strength with some advancing. The following dates moved higher over the past few weeks. U.S. Gold coins, especially the generic dates, have adjusted according to supply and demand by investors. Gold has changed very little since our last printed issue but there are still some changes. The $2 ½ Liberty Gold is higher in MS64 at $760, but the MS61-MS63 grades are down slightly. The $5 and $10 Liberty series are mostly flat since the last update; $20 Liberties are mostly higher from VF through the MS64 grades. Saints have also advanced in all grades up through MS66. The Twenties market seems to be attracting the majority of the trading at this time.